The Blueair Pro Family Boosts energy and productivity Designed to work as hard as you do, the Blueair Pro makes everyone at work or home feel better and become more productive. With its award-winning design, innovative technology and exceptional performance, the Blueair Pro provides professional air purification. Based on Blueair HEPASilentTM Technology, the Blueair Pro is a perfect combination of efficiency, An office air purifier with whisper-silent operation The Blueair Pro is quieter than a whisper on its lowest setting, and no louder than a quiet conversation on the highest. So unfortunately, it will never distract you or your colleagues from working.elegance and environmental consciousness. The Blueair Pro is quieter than a whisper on its lowest setting, and no louder than a quiet conversation on the highest. So unfortunately, it will never distract you or your colleagues from working.elegance and environmental consciousness. 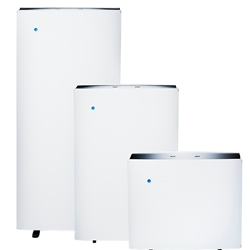 An intelligent air purifier, the Blueair Pro XL comes with the Blueair Air Intelligence Module. The module automatically tests particle and gas levels in your indoor air and adjusts the fan speed to maintain the optimal clean-air environment.